Besides inspect the tires, you can also change a few driving habits to help ensure a safer ride. Adding distance between the vehicle in front of you and yourself can allow more time to react if they slam on the brakes or encounter something. It will also give you more distance if you need to stop as well. It is recommended to stay at least three seconds behind someone when driving. That should be doubled or tripled in the case of poor weather. The air pressure should be checked on a regular basis, this is especially important during the winter. For every temperature drop of ten degrees, they can lose one pound per square inch of air pressure. Underinflated tires will offer less traction when traveling. You will also notice a reduction in fuel mileage. 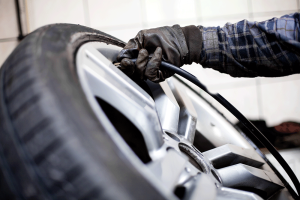 Underinflated tires can also wear out prematurely and may cause damage to other parts of your vehicle. If you notice a tire needs to be inflated consistently, bring your vehicle in and we can inspect the tire for any damage that it might have. Also make sure to check them to ensure they have adequate tread depth. This can help to maintain good mobility and traction when you are traveling on slush or snow covered roads. Tires with the proper amount of tread depth can offer better traction. This makes it easier to make their way through sleet, slush, or snow. By having sufficient tread on the tires it can help reduce the chance of hydroplaning. Especially if there is precipitation on the road’s surface. This can also help to prevent accidents that may occur from losing control of the vehicle. If you notice any issues with the tires on your vehicle, bring it in. We can inspect and fix the source of the issue for you. You can have a safe and pleasant driving experience. This entry was posted in Auto Repair, Tire Repair, Tires, Tires in Winter. Bookmark the permalink.